In the last few years with the blogs going mainstream content syndication via RSS feeds has become commonplace. The advantage of RSS is that you don’t actually need to visit a website to get the updated content. You can monitor several websites from your feed reader and check for the latest content. Previously emails were the preferred mode of getting updates via newsletters from your favorite websites, but with RSS that has changed for the better. RSS is faster and more convenient. One of the features that was missing in Feed Readers, is getting reminders for events, like you can in Emails. However now even that is possible. If you spend more time on Feed Reader than you do checking email and would like to get event reminders via feeds, Reminder Feed is a cool new service, that lets you create reminders that show up in your feed reader. 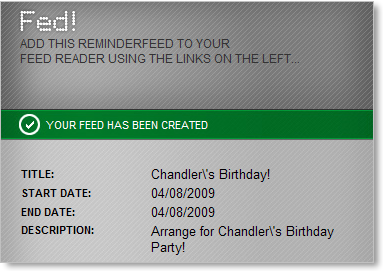 When you visit the Reminder Feed homepage, you are presented with a simple form that asks you fill in some information. You need to fill some basic information like the Title of the reminder, when would you like to be reminded, description of the reminder etc. There is option to put in a link, but its not necessary, its just in case you want that link to appear in the reminder. You can put in a link if you need to visit a certain site on certain day or something similar. The password section is just to restrict the reminder from being edited by someone else, especially if you are sharing this feed/reminder with someone else. 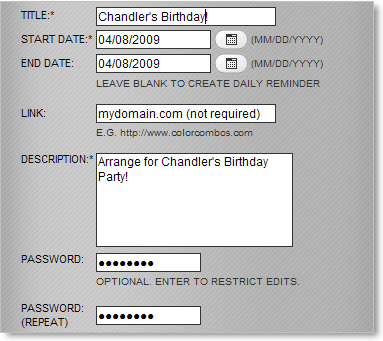 Once you have filled in all these details hit the create button and the reminder would be created. Once the feed is created you have quite a few options to subscribe to this reminder in your preferred feed reader. It also provides you with an option to select the correct Time Zone, so that the reminder is delivered at the correct time. Another option you get on this screen is to share this reminder with someone. When you click on the share option, a link which lets people subscribe to this particular reminder is created. Pretty useful if you want a certain group of people to remember about an event. Reminder feed would prove to be quite useful for people who spend a large portion of their online time, going through Feed Readers. 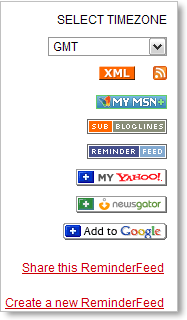 Previous articleHow to create a Firefox Profile and Manage Multiple Profiles.